In the “General” tab of the “Document Statistics” dialog, you will find information about the text, author, time the document was last saved, etc. The “Text Statistics” tab contains detailed information about how many words, paragraphs, lines, characters (with and without spaces) your text contains, as well as statistics about your current work session. There are tabs that show which “fonts” and “style templates” have been used in your document. You can use the button to select all text using a specific font or style template. There is also an option to “delete” style templates that have not been used. 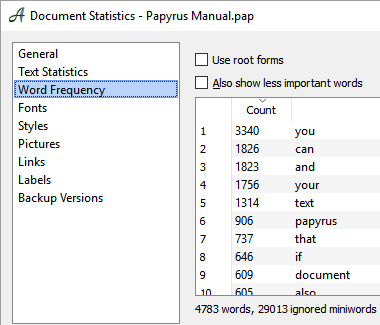 Statistics for word frequencies, word counts, etc. In this tab you can see which words are used how often in your document. This allows you to see any words you may have used more often than you would like. You can choose to sort this list alphabetically and to see the root forms of the words. Words that belong to the style analysis’s list of “ignored words” will not be taken into account. 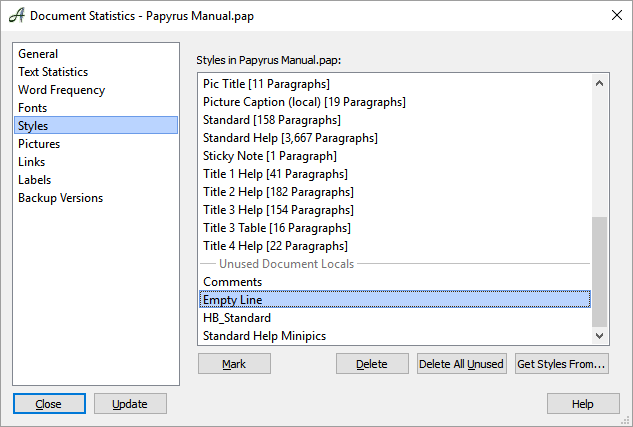 If you want to save these results for a certain point in time, you can select “copy to clipboard” and then paste them into a Papyrus document to save for your records. Use the “update” button to bring the statistics up to date if you have made any changes.